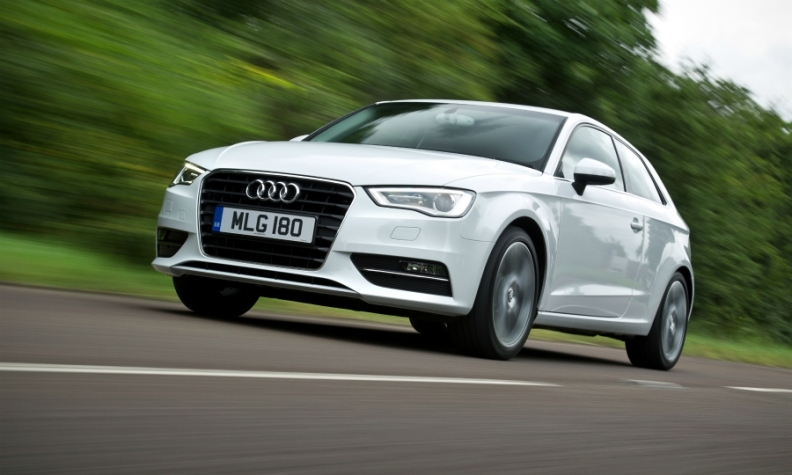 The Audi A3 has a big lead over its rivals in the compact premium segment, but Audi trails BMW and Mercedes based on overall sales in the sector. Audi, BMW and Mercedes-Benz are largely responsible for the growing success of the compact premium segment because of their commitment to expanding their offerings in a part of the European market that used to be dominated by models such as the Volkswagen Golf and Ford Focus. Through August, sales in the compact premium sector were up 9.2 percent to more than 606,000 units, putting the sector in position to account for 6 percent of Europe's total new-car sales this year, according to figures from JATO Dynamics. That success is expected to continue as compact premium sales are forecast to top 1 million by 2020, LMC Automotive predicts, making it the first premium segment to reach seven-digit sales. What is driving the growth is the rapid addition of new variants by Audi, BMW and Mercedes. The intensifying competition has made it possible for all three German automakers to claim to be market leaders, depending on how the sums are worked out. Based on sales of a single model line, the Audi A3 held onto its traditional lead in the first eight months, despite a 7 percent drop in sales and the threat posed by the continued success of the second-placed Mercedes A class, which posted an 18 percent rise. 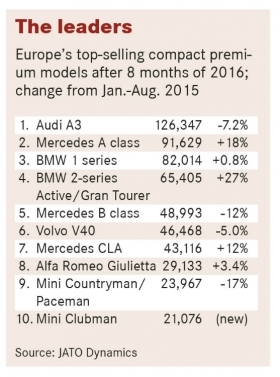 BMW’s 1 series was third (see table, below). However, it is BMW and Mercedes that vie for overall leadership when sales of all the different body styles -- hatchback, sedan, station wagon, minivan, coupe and convertible -- are added up. (The calculations for this story exclude sales of premium compact SUVs and crossovers, which Automotive News Europe includes in a stand-alone segment). For example, growth of the Mercedes CLA sedan and CLA wagon, combined with sales of the A class and B class helped Mercedes take the overall lead in the compact premium segment with a volume of almost 185,000 units through eight months. BMW was close behind with combined premium compact sales of nearly 175,000 units. The total includes the successful 2-series Active Tourer and Gran Tourer minivan variants, the 1-series three- and five-door hatchbacks as well as the 2-series coupe and convertible. Audi ranks third in overall compact premium sales because it has diversified the least of the three German automakers. The sedan derivative of the A3 remains relatively niche at 20,312 sales through August, with the convertible version of the three-door hatchback accounting for less than 7,000 units. BMW, meanwhile, has scored spectacularly with its decision to launch a five- and seven-seat minivan range based on its UKL front-wheel-drive platform. 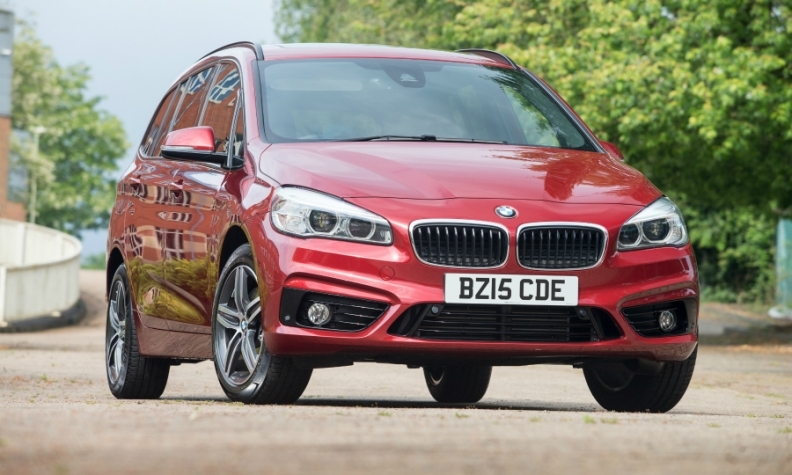 Sales of the 2-series Active Tourer and 2-series Gran Tourer grew 27 percent in the first eight months to 65,405, beating its main rival, the Mercedes B class, and even outselling popular models such as the Renault Scenic and Ford C-Max minivans during the period. "BMW has surprised the industry by bucking the negative trend in the minivan segment," JATO analyst Felipe Munoz told Automotive News Europe. BMW's minivan success is part of the reason why it can claim it is king of the compact premium segment. The other is the big contribution from sister brand Mini, which when combined with BMW brand sales gave BMW Group the lead through eight months with a combined volume of 219,075 units. Last year UK-based Mini entered the segment with a new, bigger Clubman, which had a volume of 21,642 units through August. The Clubman is on pace to pass one of its sister models, the Countryman crossover, which is slumping as Mini prepares to launch a new version of the car that will likely be classified as a compact SUV. The BMW 2-series Gran Tourer (shown) and Active Tourer are the top-selling compact premium minivans in Europe. There is a key financial reason why automakers are investing to expand in the segment. The average price for compact premium cars (excluding the minivans) in the top five European markets is 31,138 euros, which is 23 percent higher than that for volume compact cars. As with other smaller segments, the gasoline share of the compact premium class market is growing, mainly because of BMW's 1.5-liter three-cylinder turbocharged unit. Gasoline sales grew 18 percent to account for 36 percent of the total through August, up from 34 percent last year. Demand for BMW's 1.5-liter powerplant rose 148 percent during the period, according to JATO figures. "This trend toward gasolines can be attributed to the recent reputation problems for diesels," JATO's Munoz said. Hybrid and EV sales dropped by 4.7 percent to 14,361 cars, despite the launch of the BMW 225XE plug-in hybrid minivan. One possible reason for the dip is the reduced incentives for plug-in models in the Netherlands. The dominant market for compact premium sales remains Germany, which leads the year with a 7.6 percent increase to 176,569 ahead of the second-placed UK, which saw sales rise 12 percent to 113,670. The biggest growth in the big five markets came from third-placed Italy, which saw demand for compact premium vehicles soar by 16 percent to 72,396, while in Spain, which ranked fifth, sales of the models grew 19 percent to 42,333. Sweden in seventh and Portugal in eighth also saw strong growth at 20 percent and 19 percent, respectively. Rivals have struggled to make a dent on the Germans, with Volvo best placed in sixth place with the V40 despite a slump of 5.1 percent in the period. Infiniti sold less than 6,000 units of the GLA-based Q30 through August, which was good enough to beat Lexus' struggling CT200h, which suffered an 11 percent sales decline.